Troubleshooting Do's are extremely important to remember since they will save you money as you follow these steps to prevent damage and save you grief should you ignore any of these which may result in a problem showing up. Take the time to go over these troubleshooting Do's first and pay close attention to removing any and all static buildup from yourself.Troubleshooting Do's consist of the following procedures. DO you make sure your hardware device drivers are up to date with any patches downloaded and installed.Take the time to visit your video card,sound card,motherboard, and other hardware manufacturer web sites to see if you have the most up to date device drivers. DO you check that all connections are seated firmly and properly in their sockets.This is a must check as these connections do tend to work themselves loose over time and cause problems you may blame on software. If you have been working in your system unit recently and you noticed a fault manifesting itself, you want to go back and take a look at all connections you were near.Look to be sure your fingers did not press against other connections and causing then to work loose. DO you perform preventive maintenance on your computer and keep it clean regularly?Its a good idea to open up the system unit and remove all dust that have accumulated on the motherboard as well as all other boards. Dirt and dust conducts heat and will cause the computer to run at higher temperatures than it normally would.Take a look at the vents in the back of the case and remove dust that have accumulated. 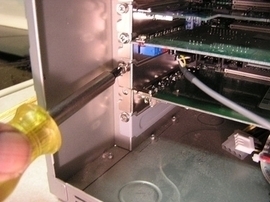 The best way to remove dust from all circuit boards in the system unit is by a can of compressed air, available at any computer store and now, most retail stores. DO you make absolutely sure you have removed any and all electrical static buildup from yourself before working inside your computer and before touching any new circuit cards and chips? Please don't overlook this troubleshoot tip.It would be a tragedy to purchase new memory only to short circuit them either before you installed them or you do so the process. RAM, short for Random Access Memory chips are very vulnerable for this.So to rid yourself of Electrical Static Charge you may consider purchasing a Wrist Strap. This tool is especially designed for this.If you don't want to go this route, you can simply touch the case's mental chassis. Troubleshooting Don'ts are just as important to remember and follow as those troubleshooting Do's and they will include the following. Don't allow your computer to run hot.Each device you install in the system will generate heat.Be sure your system is well ventilated.If you install more than two extra devices, you should consider installing an extra cooling fan. Cooling fans are easy to install and will be well worth the effort.They come will instructions that are easy to follow. It may be best to simply keep the extra devices in your system down to two or three at the most. Don't use a brush when you decide to clean the circuit cards and motherboard in your computer.They create static electricity that will render them useless.If you don't have a can of compressed air, wait until you can get one. Don't download and install files from the Internet without scanning them for viruses first.This as particularly true for any applications or files you download from file-sharing networks. Don't plug in your mouse, keyboard, or any peripheral while the computer is on.Switch the computer off before disconnecting or connecting anything from it. You may have escape that one time when you turn on your computer and something went wrong.But it will happen at one time or another.Don't add to the problem by failing to Do such tasks as removing static buildup. Learn to troubleshoot your computer with great care and you'll be richly rewarded by the fact that you were able to diagnose the problem and were safe in the process. knowledge and confidence of every computer user.